While objectives 1–3 have been dealt with in the chapters so far, this chapter is dedicated to objective 4. That is to say, whether we can identify a certain common horizontal (or rather a specific) pattern in referring to these terms of ethics and morality, and whether we can thus identify an ethical spirit based on an analysis of these legal texts; or whether we have to ascertain a gap, which has to be filled by other means? of a secular approach to values. René Smits, The Invisible Core of Values in the European Integration Project (Smits 2018, 224). the intention of the authors of a legal system, which is reflected in a lattice of various different provisions. In a metaphorical sense, this ‘spirit’7 can be described as a ghost that maybe cannot be seen, but which is nevertheless present in terms of this lattice; or, as mentioned above, the discovery of a common approach which can serve as a basis of understanding of the underlying philosophy of EU law.8 The reason, why this definition includes “the authors of a legal system” (plural) and not “the legislator” is simply because we have seen several authors in Sects. 3.1– 3.3.4. From the MS as “Masters of the Treaties”, the EP and the Council (i.e. the ordinary legislative procedure), the CJEU (case-law), and finally to the MS in implementing directives, to name but the most important ones. The spirit of a legal system obviously can change over time. The spirit of EU law in its infancy was different at the beginning (starting with coal and steel, spilling over to the general economic field), compared to what it is today (also comprising the political field and entailing human rights and values). It is also relative to those different provisions and processes. This relativity is reminiscent of the ‘relation’ aspect, which has also been stressed by Montesquieu. In his famous book, the ‘spirit of laws’ (‘De L’esprit des Loix’9), he wrote that the spirit of laws “consists in the various relations which the laws may have to different objects”.10 In that regard he mentioned the “nature and principle of each government”, “the climate of each country”, the “relation to the degree of liberty which the constitution will bear, to the religion of the inhabitants, to their inclinations, riches, numbers, commerce, manners, and customs”.11 In addition, he continues: “These relations I shall examine, since all these together constitute what I call the Spirit of Laws”.12 These relations13 add up to this lattice that reflects this spirit, in our case, ‘the ethical spirit of EU law’. To begin with, some introductory remarks. In the context of the above-mentioned determination of the substance of ethics, some categories are more useful to extract this ethical spirit, others less so. The most fruitful categories were those where ethics was used as a supportive argument [2. ], or where the determination took place via codes of conduct [5. ], especially if these codes of conduct entailed certain principles, as well as if the content of ethics was determined in the relevant legal document itself [7.]. If ethics was only used as an argument against interference from the EU [1. ], if ‘only’ a parallel ethical assessment (besides the legal one) was opened [3. ], or if substance wise ethics has not been determined at all [8. ], then these categories obviously are less rewarding. Obviously, we cannot harvest any useful ‘ethics fruits’, if the determination takes place elsewhere, i.e. in case of ethics committees [4.] and in reference to other documents [6.]. The same holds true if in case of codes of conduct [5. ], these documents, in the future, will be drafted at a different level (e.g. by MS or companies). The respective contribution of these categories to our quest for the ethical spirit of EU law can be displayed as follows (see Table 4.1). Question No 1: In EU law’s references to ethics, can we identify any philosophical theory at all? Question No 2: If yes, would this comprise one or more philosophical theories? Question No 3: If yes, should this be understood as an unconditional reference to one or more philosophical theories, or only as pointing towards a certain idea? When now, hereinafter, certain examples will be assigned to the three normative theories, the following has to be emphasized: As far as this can be judged on the basis of the research conducted, the various ‘authors’ of the EU’s legal system have never explicitly referred to one of these normative theories. Hence, question No 1 (identification of any philosophical theory) can only be answered with regard to implicit references. Therefore, the following ‘disclaimer’ has to be stressed. The following examples can be interpreted as pointing into a certain direction, but it is not the case that sometimes other interpretations would not be possible. As mentioned above, according to deontology actions are intrinsically right or wrong, irrespective of their consequences. A similar deontological and anti-commodification approach can also be found with regard to animals, when the killing of seals “for commercial reasons” is seen as intrinsically wrong due to “public moral concerns”, whereas this is not the case for seal hunts traditionally conducted by Inuit and other indigenous communities.19 Hence, to some extent also a consequentialist approach. In addition, the statement on an ethical accountability of researchers “towards society as a whole”25 can be interpreted as a deontological approach. From the CJEU’s case-law we have seen so far, we can add the cases on human dignity, where the Court in Omega (Oct. 2004) accepted the German notion of human dignity, which has a clear deontological bedrock.26 In a similar way as Germany has brought forward this national constitutional concept of human dignity, in Brüstle (Oct. 2011) the Court had to deal with human dignity as it was mentioned in the 1998 ‘Directive Biotech’. The Court’s approach of opting for a wide interpretation of the notion of ‘human embryo’ based on human dignity also points into this deontological direction. The entry into force of the Lisbon Treaty (Dec. 2009), enshrining the EU’s common values clearly strengthens this approach. As mentioned above, according to consequentialism actions are morally right or wrong depending on the quality of the consequences of action. The request “to ensure the ethics of transplantation by adopting measures to eliminate ‘transplant tourism’”28 could be interpreted as a consequentialist approach, as the ethical quality of the action of the addressed states is based on the outcome of their action, i.e. the elimination of transplant tourism. While these examples display a consequentialist approach in order to determine moral correctness and falseness of action, we also have consequentialist examples elsewhere in EU law. The effectiveness of EU law, often even in other language versions referred to as “effet utile”, has become of paramount importance in the case-law of the CJEU. In essence, it states that the provisions of EU law must be interpreted and applied in such a way that they fulfil their practical purpose and have practical effect. On this basis, the requirement of the practical effectiveness of EU law serves the CJEU as an explanatory element with regard to practically all institutes of EU law and in this respect runs like a red thread through the case-law of the Court.31 In this case-law, the key interpretative approach of the Court is the outcome, the assertion of EU law. Although, this ‘effet utile’ approach finds its limitations, as there has to be an “appropriate balance between Member State autonomy and the ‘effet utile’ of EU law”.32 When analysing the explicitly mentioned “effet utile”, Advocate General (AG) Kokott referred to “the spirit and purpose of” the relevant provisions of EU law.33 As mentioned above, this ‘effet utile’ case-law is not directly related to ethics and morality. As we have seen above,34 the Court tackles ‘sensitive issues of ethical nature’ with a purely legal methodology, which, nevertheless, still renders a decision on this ethical topic. Hence, the ‘effet utile’ case-law can also be of indirect relevance for our topic. All these examples point towards a consequentialist approach, both relating to ethics and morality, but also elsewhere in EU law (effet utile, impact assessments). All these examples can be seen to point towards virtue ethics, if they are also reflected in the corresponding behaviour. Consequently, we have seen examples pointing into the direction of all three normative theories, which answer the above-mentioned three questions. However, as this book follows an inductive approach, likewise, in the following, examples referring to minimal ethics, principlism and communitarianism will be addressed. Minimal ethics only defines moral norms for a core, while this claim does not exist for the periphery. The most prominent example, in this regard, is the field of patentability of biotechnological inventions, a much-contested issue, which we have already seen at various times throughout this book. This has been solved in the following way: Art 6 of this directive defines a core in para 2, where MS and the EP where able to reach a compromise; in the words of AG Cruz Villalón: “a minimum, Union-wide consensus for all Member States”.56 This compromise defined at EU level comprises cloning of humans, modification of the germ line genetic identity of humans, uses of human embryos for commercial purposes, as well as modification of the genetic identity of animals. Obviously, there was no consensus concerning other equally sensitive issues, hence, para 1 of this provision delegates the question of answering the unpatentability to the national level, where the commercial exploitation of inventions has to be assessed against the notions of “ordre public or morality”. This approach of a minimal ethics at EU level for a core, capable of consensus, and a possible divergent national approach at the periphery, could serve as a role model for other fields. A minimum approach, however of a different kind, can be seen in a resolution, which states that in case sanctions cannot “bring about a change of regime in a particular country, or at least a major change in the policy of that country’s government, their imposition may also serve simply as an expression of moral condemnation”.59 This is not a true minimum approach which achieves consensus in a core and leaves open questions at the periphery, rather the primary objective (i.e. change of regime) has failed, that is why only moral condemnation remains. All these examples display a ‘minimal ethics’ approach. Such an approach might be suitable for areas, where a consensus amongst MS (and the EP) can only be achieved in a (united) core, while the periphery is left to potentially diverse solutions in the MS.
Principlism determines ethics in a substantive way (cf. in the field of medical ethics, Beauchamp and Childress), where ethics is defined based on a certain number of moral principles (e.g. autonomy, beneficence, nonmaleficence, and justice). As mentioned earlier,60 we can distinguish a legal and a philosophical understanding of ‘principles’. These principles overlap with those which have been qualified as legal principles above in the context of lobbying: accountability, diligence, impartiality, independence, objectivity, responsibility, transparency. Again, the question of distinguishing virtues from legal as well as philosophical principles remains a challenge. One of the most comprehensive examples can be found in the field of nanosciences. The annex of this code of conduct, which is “based on a set of general principles”, mentions the following ones.64 Meaning (which comprises comprehensibility for the public, respect for fundamental rights, as well as acting in the interest of the well-being of individuals and society); sustainability (referring to the United Nation’s Millennium Development Goals, as well as avoidance of harm or creation of “biological, physical or moral threat to people, animals, plants or the environment, at present or in the future”); precaution (basically referring to the EU’s precautionary principle65); inclusiveness (principles of openness to all stakeholders, transparency, access to information, as well as stakeholder participation in decision-making); excellence (also comprising “integrity of research”); innovation; as well as accountability (with regard to “social, environmental and human health impacts […] on present and future generations“). These “general principles” address both the legal as well as the ethical sphere, without providing a clear distinction. As we have already seen elsewhere, in the field of biotechnology, reference is made to the national level of MS within the context of “ethical principles”,66 while in the same directive we find an undetermined reference to “basic ethical principles”67 for the question when the EGE can be consulted. All these examples can be attributed to principlism. From a theoretical perspective, one could criticize the fact that it is left open whether these principles are purely legal ones, purely philosophical ones, or a combination of both. Yet, from a pragmatic perspective, this approach has to be welcomed, as the content of ethics is more clearly determined. In summary, it can be said that in EU law’s references to ethics, we can identify normative theories (question No 1), although only implicit and no explicit ones, covering all three proponents (question No 2). All the examples we have seen cannot be understood as unconditional references, but only as pointing towards these normative theories (question No 3). Can we identify a certain common horizontal (or rather a specific) pattern in referring to these terms of ethics and morality? We have seen different approaches referring to the normative theories of deontology (putting an emphasis on human dignity), consequentialism (with examples in the field of ethics and morality, but also elsewhere in EU law, such as effet utile and impact assessments), and virtue ethics (especially, but not only in lobbying), as well as minimal ethics (Directive Biotech, etc. ), and principlism (lobbying and nanosciences). There is clearly no horizontal, but a specific approach in addressing different needs in different fields, from independence of members of investment tribunals to research integrity in nanosciences. Hence, we can address both an ethical spirit in the sense of the intention of the various authors of EU law, which is reflected in a lattice of various different provisions, as well as a gap that still needs to be filled. So far, the examples covered those authors authorized to issue binding and non-binding legal provisions, not specifically tasked to deal with ethics. Accordingly, we will now turn to an entity that, while ‘only’ having an advisory function, is specifically tasked to deal with ethics. The practical impact of EGE opinions can, amongst others,68 be seen from the EU’s research funding programme Horizon 2020, where the relevant regulation states that “[t]he opinions of the [EGE] should be taken into account”.69, 70 In the field of patentability of biotechnological inventions, the already widely covered directive states that the EGE “evaluates all [sic!] ethical aspects of biotechnology”.71 This directive dates from 1998, hence, the year after the EGE’s establishment. Due to rapid scientific developments in biotechnology and genetic engineering in the late 1980s and early 1990s, there was need for an institutionalized framework facilitating debate and addressing public concern as to ethical implications.72 Hence, in April 1991 the EC stated that there is a need for a “consultative structure on ethics and biotechnology”.73 The Group of Advisers on the Ethical Implications of Biotechnology (GAEIB) was created on 20 November 1991. After the first mandate of two years, the EC addressed the necessity “to clarify further value laden issues in relation to some applications of biotechnology”, hence to “reinforce the role of the [GAEIB]”.74 After the mandate had expired on 31 July 199775 and the legislative process leading to ‘Directive Biotech’ was in full swing,76 the EC on 16 December 1997 decided to replace the GAEIB by the EGE, “extending the Group’s mandate to cover all areas of the application of science and technology”.77, 78 The EGE was then established in December 1997.79 As of 2000,80 the EGE was part of the ‘Bureau of European Policy Advisers (BEPA), a Directorate General (DG) of the EC, reporting directly to the EC president.81 Nowadays, the EGE is docked with DG Research and innovation.82 While it clearly makes sense to link the EGE to the field of research and innovation, it could also be seen as a downgrading of the EGE, as there is no direct and regular access to the EC president (Juncker).83 For an overview of the EGE’s development, see Table 4.2. The Members shall reflect the broad cross-disciplinary scope of the group’s mandate, embracing philosophy and ethics; natural and social sciences; and the law. However, they shall not [!] perceive themselves as representatives of a particular discipline, worldview, or line of research; they shall have a broad vision which collectively reflects an understanding of important ongoing and emerging developments, including inter-, trans-, and multi-disciplinary perspectives, and the need for ethical advice at the European level. The opinions are usually structured in the following three parts116: the first part consists of recitals of the reference texts, which form the starting point (e.g. request by EC president, relevant EU law, relevant international law, primary scientific texts, relevant previous EGE opinions, expert reports and roundtable hearings). 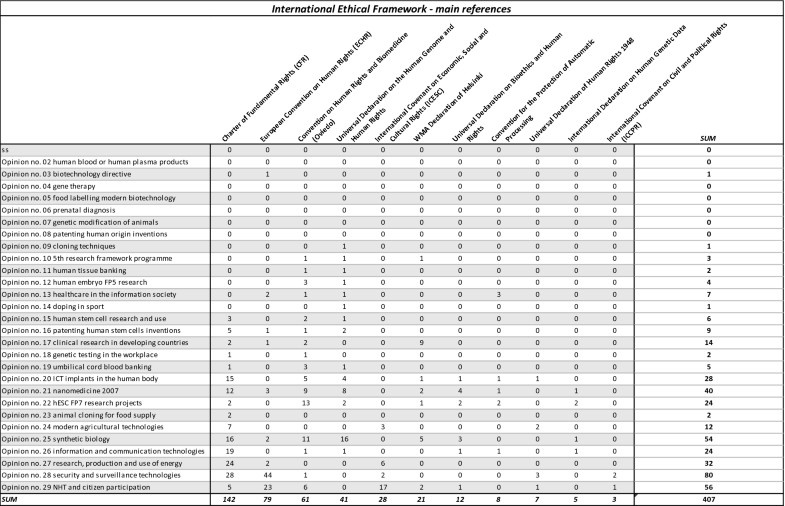 The second part consists of three sections, which provide the scientific, legal and ethical backgrounds to the opinion, and the third part presents the opinion with recommendations.117 Since the beginning, EGE opinions have increased in both scope (from bioethics to sciences and new technologies) and size (from six pages to typically around 100 pages).118 While some argue that theoretically the EGE is not formally bound to the CFR,119 there are various references in EGE opinions to this key human rights document, as we will also see in the following. 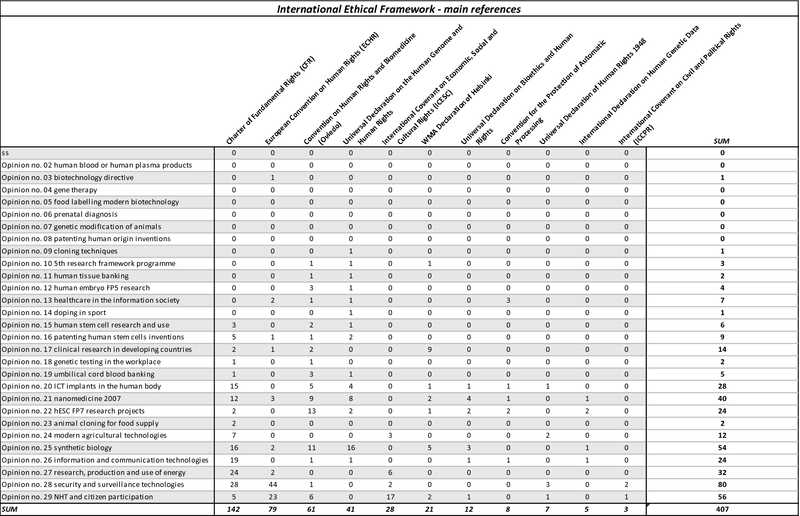 As it is the EGE’s specific task “to advise […] on ethical questions”, it remains to be seen how many of the gaps concerning the EU’s ethical spirit within the lattice identified so far can be filled based on the findings from the EGE’s opinions. Thus, in a similar way as Sect. 4.1, this chapter is dedicated to objective 4, which is to say to answer the question whether the EGE substantiates its ethical reasoning on one of the three normative theories. This chapter is based on a research project, where the research design has been developed by the author, the research itself conducted as well as the research design further specified by Matthias Pirs,120 and his Master thesis having been supervised within the ‘Integrity Research Group’ by Lorenzo Pasculli (now: Coventry University) and the author. The exalted moral status which every being of human origin uniquely possesses. Human dignity is a given reality, intrinsic to human substance, and not contingent upon any functional capacities which vary in degree. […] The possession of human dignity carries certain immutable moral obligations. These include, concerning the treatment of all other human beings, the duty to preserve life, liberty, and the security of persons, and concerning animals and nature, responsibilities of stewardship. This deontological concept of the ‘intrinsic value’ comprises, according to the “Kantian understanding of human dignity [which] emphasises moral responsibility”, a prohibition of “treating human beings as mere ‘objects’ of the interests of others”.146 According to the EGE, this is especially important in case of vulnerable human beings,147 referring to an idea addressed by Beyleveld & Brownsword in their seminal work ‘Human Dignity in Bioethics and Biolaw’. Based on “the notion of dignity as a virtue”, the idea of responsible behaviour, according to them, should be taken seriously; in that regard, the responsibility that underlies the notion of dignity, is a “responsibility that goes to questions of character as much as to the appearance”.148 Then they continue with the part that was (partially) quoted by the EGE149: “Specifically, it is the idea of dignity as a particular practical attitude to be cultivated in the face of human finitude and vulnerability (and, concomitantly, the natural and social adversity that characterizes the human condition)”.150 Hence, for the EGE, dignity “is the basis for more specific principles, rights and obligations, and is closely connected to the principle of justice and solidarity”.151 This corresponds to human dignity enshrined in Art 1 CFR and Art 2 TEU (EU’s common values), as well as the above-mentioned emphasis not only on rights, but also on obligations. This normative theory plays a role when assessing the consequences that arise from developments in the field of science and new technologies, i.e. the EGE’s turf. In the context of risk assessment, these consequences relate to possible benefits versus possible risks. Anthropocentric approaches, placing humans in the centre of the universe, focus “on consequential considerations and issues related to potential consequences from the use of synthetic biology for human beings (risk assessment and management and hazard considerations […])”.166 The analysis of risk comprises the three elements of risk assessment, risk management and risk communication, where the already mentioned precautionary principle167 is particularly relevant for risk management.168 Such risk assessment is emphasized by the EGE “in order to protect human dignity and the autonomy of persons”, in a similar way as the importance of the precautionary principle.169 Hence, linking this consequentialist approach to human dignity, as mentioned above in the context of deontology. As mentioned above, based on the first formal mandate (in 2005), since 2008 (i.e. Opinion No 23) the EGE has started to refer to normative theories, especially via their proponents. In this regard, it is fascinating to see a similar development in the legal sphere. As of Opinion No 16 (patenting of human stem cells inventions, May 2002), which falls in the 2nd mandate,186 the EGE has also increasingly (9 hits) started to refer to EU and international documents, mainly in the field of human rights (see Fig. 4.1). EGE references to key documents. Overall, we can observe an extension not only in pages, in references to normative theories as well as to these EU and international documents, but also in scope, as the group has moved from purely bioethics also to broader principles of human rights, as well as an increase in group members. There has also been an increase of the duration of the mandates, except for the last one.190 As we know from the job of the president of the European Council, newly created by the Lisbon Treaty,191 an appointment for two times 2.5 years allows for more control, compared to an appointment for five years. Apart from the normative theories covered in this chapter and based on the terminological delimitation,192 the EGE has referred to values (human dignity, justice, freedom, solidarity, etc. ), to human rights, as well as to principles (privacy, informed consent, non-discrimination, equity, precaution, sustainability, etc.). In the following, the questions mentioned at the beginning194 will be answered in more detail, as the results of Sect. 4.2 on the EGE will supplement those of Sect. 4.1. With regard to the possible identification of normative theories (i.e. question No 1), we have seen implicit references in EU legal documents, implicit as well as explicit ones in EGE opinions. The latter have mainly referred to several proponents of these normative theories, but have also explicitly addressed these normative theories. Implicit references in EGE opinions especially addressed deontological ideas via the EU value of human dignity. Question No 2 can clearly be answered in terms of addressing several normative theories, although these three theories are not equally represented. In EGE opinions, deontology clearly prevails, and we find less examples of virtue ethics.195 However, it is important to emphasize that often the EGE refers to one normative theory, by emphasizing the consequences if the decision-makers opt for this theory, besides pointing to another normative theory, also emphasizing the consequences for this other theory. Hence, while there are most references to deontology, this disclaimer has to be kept in mind. It was also remarkable to see justice as the “institutional dimension of ethics”.196 Justice occurred both in terms of distributive justice (Rawls), as well as with regard to future generations (Jonas). Human dignity, in Waldron’s interpretation, also has an institutional component, in terms of citizens’ entitlement to transparency in the decision-making process. Consequentialism has been addressed by the EGE in the context of risk assessment. Apart from ethics, in EU law in general we have seen that impact assessment plays an important role in EU decision-making, as well as the ‘effet utile’ principle in CJEU case-law, both of which also have a consequentialist connotation. Utilitarian philosophers have been addressed when taking a more bio-centric approach, in particular with regard to animals. It is worth mentioning that the EGE both in case of risk assessment and with regard to animals has also taken a deontological approach, as it has emphasized the importance to protect human dignity and the autonomy of persons (in case of risk assessment), and has also referred to the intrinsic value of animals, as mentioned above. Social contract theories have been addressed in terms of security and surveillance technologies. Although drafted during the age of enlightenment to legitimate the authority of the state, this concept is still of relevance and was applied to these new challenges. Both for EU legal documents, as well as for the EGE opinions, all the examples we have seen cannot be understood as unconditional references to one or more normative theory(ies), but only as pointing towards them (question No 3). The EGE often refers to several views, for instance to deontology and to consequentialism,200 without explicitly favouring the one, or rejecting the other view. In other words, in case of explicit references to normative theories, the EGE contrasts different philosophical views; hence, it is not possible to assign the EGE exclusively to one of these three normative theories. Another question was, whether we can identify a certain common horizontal (or rather a specific) pattern, when referring to these terms of ethics and morality in EU legal documents (Sect. 4.1), respectively when addressing these normative theories (Sect. 4.2). As we have seen above with regard to EU legal documents, there is clearly no horizontal, but a specific approach in addressing different normative theories in different fields. Deontology plays a role in order to refer to general principles of morality, consequentialism to address effects of the ethical challenge at hand, and virtue ethics is addressed in the context of ‘pursuing a good life’.201 Against the background of the diverse topics of the 30 opinions so far, the EU’s values with their corner stone of human dignity, a deontological concept, can be seen as the most horizontal approach in this regard. Having now analysed the different ‘layers’ (in the sense of the hierarchy) and the different ‘areas’ (in the sense of the ‘separation of powers’) of EU law, the final question (i.e. objective 4), as to whether we can identify an ethical spirit of EU law, can be answered as follows. As stated above, in this book, the notion of spirit is understood as “the intention of the authors of a legal system, which is reflected in a lattice of various different provisions”. In Sect. 4.1 with regard to EU legal documents, we have already identified both an ethical spirit, as well as a gap that still needs to be filled. The findings of Sect. 4.2 point in a similar direction, further emphasizing the predominant role of the EU’s common values and the corner stone of human dignity. Apart from explicitly referring to these concepts from a legal angle as the values enshrined in Art 2 TEU, the deontological normative arguments addressed in the EGE’s opinions also point in the same direction, hence further closing the gap addressed earlier. Having identified this ‘lattice’ of ethics in the different layers and areas, both binding legal provisions and soft-law, including the EGE’s opinion, this does not mean that we have reached a final position. This analysis is valid as of 2018, might however be different in the future, and was clearly less elaborated in the past. One example in this regard is Opinion No 12, on ethical aspects of research involving the use of human embryo in the context of the fifth framework programme, from November 1998. The EGE appropriately states that the EU has no proper competence in medicine, hence such protection falls within national competence. Nonetheless (i.e. first limitation), EU authorities “should be concerned with ethical questions resulting from medical practice or research dealing with early human development”.202 However, (limitation to the first limitation), in doing so, EU authorities have to take into account “the moral and philosophical differences, reflected by the extreme diversity of legal rules applicable to human embryo research”, as “because of lack of consensus, it would be inappropriate to impose one exclusive moral code”.203 The question remains, if this diversity stipulated in 1998 with regard to embryo-related questions is still valid today, having in mind the growing importance of EU values, especially since 2009. To sum up, this ethical spirit is in statu nascendi, as we can also see from the ‘united in diversity’ approach we have seen in case of EU primary law. Addressing these elements of constant development on a time line, it is worth mentioning that also the status quo, as viewed from today, has addressed retrospective elements (the historical responsibility for climate change and the moral obligation to assist ACP countries),204 as well as the obligations with regard to future generations (nanosciences, Hans Jonas, etc.). 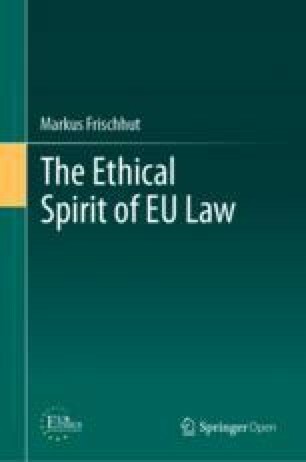 The ethical spirit of EU law identified in this book is subject to the following limitation. It only applies to EU law. Hence, this does not cover all the examples where reference is made to the national or local level (e.g. “compliance with local codes of ethics”205). In those situations, the ethical spirit of EU law can only have an indirect influence, especially via the EU’s common values. This is similar to ‘morality’ being determined by the different MS, but constrained by the EU’s proportionality principle (especially the requirement of ‘coherence’), as well as the prohibition of double morality, etc., as stated in the CJEU’s case-law. One final word about the just addressed difference in terminology, i.e. ethics versus morality. The reason why this book has not coined the term of the ‘moral spirit of EU law’ is primarily due to the reason that the notion of ‘public morality’ has essentially been used as a protection shield, in EU primary law (called ‘reason of justification’), in international agreements (called ‘exception clause’), as well as in EU secondary law.206 Besides this, ‘public morality’ is a legal term while ethics is a term of practical philosophy. In terms of morality, ‘public morality’ is a collective term, while we have also seen a lot of variations of morality: ‘moral support’,207 ‘moral condemnation’,208 ‘moral development’,209 a ‘high moral standing’,210 ‘moral safety’,211 ‘moral responsibility’,212 as well as the economic term of ‘moral hazard’.213 The notion of ‘ethics’,214 on the other hand, has not been used in such a collective way.215 It has the advantages of not being a legal term (although used in legal texts) and it has not been used as a ‘protection shield’.216 Now that we have examined the ‘ethical spirit of EU law’ from a philosophical point of view, we turn to the legal perspective. Allen et al. (1990, pp. 1173–1174); no emphasis added. The Hamlyn Publishing Group (1970, pp. 184–208). Act IV, Scene I. Venice. A Court of Justice; The Hamlyn Publishing Group (1970, p. 204). This quotation has been retrieved from “The Complete Works of M. de Montesquieu (London: T. Evans, 1777), 4 vols. Vol. 1. 27.8.2018”, http://oll.libertyfund.org/titles/837#Montesquieu_0171-01_115; book I, ‘chapter III, of positive laws’. Dratwa (2014, 113 et passim). See also Brännmark (2017, p. 176), who points out that “a reasonable foundational story does at the same time add something more to a framework than just a philosophical basis; it also adds a spirit in which the rules or principles of the framework can be interpreted and implemented”. Montesquieu, Charles de Secondat, Baron de (1927). This quotation has been retrieved from “The Complete Works of M. de Montesquieu (London: T. Evans, 1777), 4 vols. Vol. 1. 27.8.2018”, http://oll.libertyfund.org/titles/837#Montesquieu_0171-01_115; book I, ‘chapter III, of positive laws’; emphasis added. In CJEU Achmea, C-284/16, paras 33–34, in the context of the autonomy of EU law and the EU’s common values, the Court referred to “a structured network of principles, rules and mutually interdependent legal relations”. On this question, see Parfit (2011). Directive Biotech, recital 40; no emphasis added. Directive Biotech, Art 6(2)(a)–(c); (d) refers to animals. EP report human rights, para 115. Regulation seal products, recitals 1 and 2. Regulation supply chain, recital 23. Directive animals, recital 12; emphasis added. Convention animal transport, recital 2; “every person has a moral obligation to respect all animals and to have due consideration for their capacity for suffering”. Convention animal experiments, recital 2; emphasis added. EC Charter researchers, Annex, Section 1. BVerfG Shooting down terror plane, 1 BvR 357/05. For various ethical approaches concerning animals, see the various contributions in Beauchamp and Frey (2014). Agreement Korea, Annex 2-D, Art 4(1). Regulation novel foods, recital 32. See, also for further examples, Ranacher and Frischhut (2009, pp. 68–70). AG Sharpston opinion of 30 September 2010, Ruiz Zambrano, C-34/09, EU:C:2010:560, para 148. AG Kokott opinion of 17 July 2014, UK versus Council, C-81/13, EU:C:2014:2114, paras 114–117; emphases added. IIA Better Law-Making, pt. 12–18 (12). GC judgment of 17 May 2018, BASF Agro, T-584/13, EU:T:2018:279, paras 170–171 (because of the principle of proportionality). See Sect. 3.3.2.2 at note 203. The code of conduct (Sect. 3.3.2.2 note 205) does not mention ‘integrity’. Art 2, 1st sentence TEU. Keeping in mind the ‘moral excellence of behaviour and character’, etc., mentioned supra in Sect. 2.3. See Chap. 3 at note 326. See Chap. 3 at note 339. AG Cruz Villalón opinion of 17 July 2014, ISC, C-364/13, EU:C:2014:2104, para 42. Regulation establishing Horizon 2020, Art 19(3). Resolution embargoes, pt. 2; emphasis added. See Chap. 1 at note 92. It is worth mentioning that apart from these substantive principles in para 1; paras 2–4 provide procedural safeguards in this respect. OJ 2017 L11/3 (4); emphases added. See also the Statement by the Commission and the Council on investment protection and the Investment Court System (‘ICS’), on p. 20. Agreement Korea, Annex 2-D, Art 1(e). EC recommendation nanosciences, Annex, pt. 3. Recently: GC BASF Agro, T-584/13; for further details, see Frischhut and Greer (2017, 331–333). Directive Biotech, recital 39: “ethical or moral principles recognised in a Member State”. In addition, several other regulations and directives, as well as courts, e.g. the CJEU and the European Court of Human Rights (ECtHR), as well as AG at the CJEU have referred to EGE opinions; for further details, see Pirs (2017, p. 32). This chapter has been drafted at the same time as the following paper; hence, certain parts can overlap: Pirs and Frischhut (2019, forthcoming). Regulation establishing Horizon 2020, recital 29. Similar in Regulation Horizon 2020 Euratom, recital 18. Recital 44 and Art 7. EC ‘Promouvoir les conditions de la compétitivité des activités industrielles basées sur la biotechnologie dans la Communauté’, SEC(91) 629 final 19.4.1991, p. 18: “Il est souhaitable que la Communauté dispose d'une structure consultative sur l'éthique et la biotechnologie capable de traiter les questions d'éthique qui se posent dans le cadre des activités communautaires. Cette structure devrait permettre l'ouverture d'un dialogue où seraient débattus ouvertement les problèmes éthiques dont les Etats membres ou d'autres parties intéressées jugeraient la solution nécessaire. Elle permettrait également à des experts délégués par les groupes concernés de contribuer à l'orientation du processus législatif. La Commission estime que cette démarche serait un pas positif en vue d'une meilleure acceptation de la biotechnologie et de la réalisation du marché unique pour les produits Issus de cette technologie.”. European Commission (1993, p. 103). EP resolution of 13 June 1997 on the mandate of the Group of Advisers on the Ethical Implications of Biotechnology to the EC (B4-0484/97), OJ 1997 C 200/258 [EP resolution GAEIB], recital A. On 29 August 1997, the EC had adopted an amended proposal: COM(97)446 final 29.08.1997. EC decision (EU) 2016/835 of 25 May 2016 on the renewal of the mandate of the European Group on Ethics in Science and New Technologies, OJ 2016 L 140/21 [EGE mandate V 2016], recital 3. This current mandate started on 28.5.2016 and lasts until 27.5.2019. It seems that the EGE follows a broad understanding of technology. EC communication de M. le PRESIDENT, en accord avec M. BANGEMANN, M. FLYNN, Mme CRESSON, Mme BJERREGAARD, M. MONTI, M. FISCHLER et Mme BONINO: Création d'un groupe Européen d'éthique des sciences et des nouvelles technologies, SEC(97)2404 final 12.12.1997 [EGE mandate I 1997]. That is to say, as of the second mandate (see Table 4.2), Mohr et al. (2012, p. 107). The EGE’s website can be accessed via http://ec.europa.eu/research/ege/index.cfm. Compared to former president Barroso, president Juncker also took a different approach in another field, by “scrapping” the role of the Chief Scientific Adviser (CSA); see Panichi (2015). Nowadays, see the EC’s Scientific Advice Mechanism (SAM), also comprising the Group of Chief Scientific Advisors; EC decision on the setting up of the High Level Group of Scientific Advisors, C(2015) 6946 final 16.10.2015, as amended by Decision amending Decision C(2015)6946 on the setting up of the High Level Group of Scientific Advisers, C(2018) 1919 final 5.4.2018. EC ‘European governance—A white paper’, COM(2001) 428 final, OJ 2001 C 287/1; addressing principles of openness, participation, accountability, effectiveness, and coherence. EC decision experts, recital 3, Art 2(4), Art 11. EC communication on the collection and use of expertise by the Commission: principles and guidelines—“Improving the knowledge base for better policies”, COM(2002) 713 final 11.12.2002, p. 1. EGE mandate V 2016, Art 2. EGE mandate V 2016, Art 4(3). Since ‘EGE mandate III 2005’ (see Table 4.2), the EC president has officially appointed the members. However, since the creation of the EGE in 1997, “the President of the Commission has been authorised by the Commission to appoint the EGE members”, hence ‘EGE mandate III 2005’ “has therefore [only] formalised this situation”. Source: response of former EC president Barroso on a parliamentary request (‘Criteria and methods for the selection of the members of the [EGE]’, P6_RE(2006)0430, answer from 17.3.2006); see also EGE mandate I 1997, p. 4. Besides this, the selection process shall be overseen by a new ‘Identification Committee’; EGE mandate V 2016, Art 4(3) and (4). EGE mandate V 2016, Art 4(1), (2) and (4). EP resolution GAEIB, pt. 3. EGE mandate V 2016, Art 4(6)(a) and (b). EGE mandate V 2016, Art 4(6)(e). In 2005, EGE also began formally to network with national ethics committees; Mohr et al. (2012, p. 107). See, for instance, the above-mentioned (preface) ‘Meeting of the National Ethics Councils (NEC) Forum and the [EGE]’ on 17 & 18 September 2018 in Vienna, organised under the Austrian Presidency of the Council of the EU. EGE mandate V 2016, Art 4(6)(c); emphases added. EP resolution GAEIB, pt. 4. Quoting former EC president Jacques Santer, in literature (Mohr et al. 2012, p. 107) the EGE was referred to as “the servant of ‘European decision-makers’, not solely the Commission”; however, in formal terms it is clearly attached to the EC. EGE mandate V 2016, Art 3. However, the EGE has also accepted requests by other institutions (especially in case of a political standstill), followed by an official request of the EC (e.g. in case of EGE opinion No 27, on energy). EGE mandate V 2016, Art 5(8). EGE mandate V 2016, Art 5(7); emphasis added. Having access also to other DGs can be important in terms of the impact of the EGE’s activities. EGE mandate V 2016, Art 5(7). However, it seems that the EGE faces no problem in establishing these links, if so desired. EGE mandate I 1997, pt. 7; EGE mandate II 2001, pt. 7; EGE mandate III 2005, Art 4(1); EGE mandate IV 2010, Art 4(1); EGE mandate V 2016, Art 5(2). It seems that the EGE has always enjoyed sufficient independence in its work. Göran Hermerén, past president and chairperson of the EGE “[does] not recollect any attempt from BEPA or the Commission to interfere with our work, nor to suggest or put pressure on us to change something in a draft EGE report” (personal communication). EGE mandate V 2016, Art 5(6) and (8), “as a ‘minority opinion’”. See for instance the dissenting opinion of Günter Virt on the controversial issue of patenting of human embryonic stem cells, in EGE opinion No 16 (European Group on Ethics in Science and New Technologies (2002, p. 19)). EGE mandate V 2016, Art 5(10). These internal EGE documents cannot be accessed, “even from within the Commission”; Mohr et al. (2012, p. 109). Statements or other forms of analyses can be produced, if operational circumstances require that advice on a particular subject should be given more quickly than in case of the adoption of an opinion (this should be followed, if necessary, by a fuller analysis in the form of an opinion); EGE mandate V 2016, Art 5(9). According to Busby et al. (2008, p. 840), the EGE was asked to give an opinion on the CFR, however declined to do so and, instead, gave the following report: European Group on Ethics in Science and New Technologies (2000). For a detailed analysis of their impact on the legislative procedure, see Busby et al. (2008) (concerning opinions 2, 3, 8, 11, 12, 15, 19 and 22) and Mohr et al. (2012) (concerning opinion 19). E.g. Directive Biotech, recital 19 (GAEIB); EC recommendation nanosciences, recital 6; Regulation advanced therapy, recital 28; Directive tissues and cells, recital 33. EGE mandate V 2016, Art 5(5). European Group on Ethics in Science and New Technologies (2005, p. 10). There are strong indications that, not very surprisingly, lawyers draft the legal parts, philosophers the ethical ones, and scientists the scientific ones. Cf. Pirs (2017, 27, A7). For further details on the methodology and the limitations, see Pirs (2017, pp. 40–45). Concerning these opinions (in EN), this project applied a qualitative content analysis (QCA) and took a mixed qualitative (assigning code categories in the relevant materials) and quantitative (analysing and interpreting category frequencies) approach. Concerning the footnote references to potential schools of thought, the QCA mainly considered those, “which were primarily referred to in the main line of reasoning (in-text citation or direct references) in the opinions”. In other words, the QCA excluded standalone footnote references, if they could not be related to one of the normative theories; Pirs (2017, p. 44). The coding process contained the following steps: reading opinions, inductive coding, lexical search, refining categories, classification, and finally narrowing down to the results, presented in the following; for further details, see Pirs (2017, pp. 43–44). The author would like to thank Nils-Eric Sahlin for pointing to the fact that an inductive method cannot lead to a theory. Pirs (2017, p. 42). As mentioned above (Table 4.2), for opinion No 30 see Pirs and Frischhut (2019, forthcoming). Opinion No 30 is on the ‘future of work’. It has to be emphasized that sometimes it could be the case that, for instance, three hits occur on the same page of the same opinion, while in other cases three hits occur in different parts of the same opinion, or in total three hits in three different opinions. That is why these numbers shall not be overestimated. Five in EGE opinion No 24 (‘agricultural technologies’) and five in EGE opinion No 25 (‘synthetic biology’). For a detailed overview, see Pirs (2017, p. 50). In the following, some key findings will be presented; for further details see Pirs (2017, pp. 52–64), respectively the above-mentioned opinions, and Pirs and Frischhut (2019, forthcoming). As far as possible, the different philosophers have been categorized according to the three normative theories. EGE opinion No 24, p. 48. EGE opinion No 24, pp. 51–52. EGE opinion No 24, p. 52; emphases added. See Weß (2010, pp. 258–259); Assmann (2018). EGE opinion No 25, p. 45. Jonas (1979, p. 36); translated with DeepL. This book is also quoted in EGE opinion No 25, p. 16. EGE opinion No 27, p. 49. EGE opinion No 27, p. 50. EGE opinion No 25, p. 39; emphasis added. Cheshire (2002, p. 10); emphases added. EGE opinion No 25, p. 39. Beyleveld and Brownsword (2001, p. 2). EGE opinion No 25, p. 39; emphases added. EGE opinion No 25, pp. 45–46; emphases added. For further details on the notion of ‘common heritage’ and Grotius, see Pirs (2017, pp. 57–59). Cf. also Pirs (2017, p. 56) with further details. EGE opinion No 28, p. 71. EGE opinion No 28, p. 77; emphasis added. EGE opinion No 28, p. 77. EGE opinion No 28, p. 78. The EGE provides the following definition: “social (or political) contract arguments classically posit that individuals have consented, either explicitly or tacitly, to surrender some of their freedoms and submit to the authority of the sovereign (or to the decision of a majority) in exchange for protection of their remaining rights”. These theories can be distinguished between some that are concerned with the origin of the state, while others focus on “the contract—the modus vivendi—between the ruler(s) and the ruled”; EGE opinion No 28, p. 62. EGE opinion No 28, pp. 61–68. John Locke (1632–1704), mentioned twice, and Jean-Jacques Rousseau (1712–1778) mentioned once (in EGE opinion No 28, pp. 61, 64). EGE opinion No 28, p. 61. EGE opinion No 28, p. 66. The author would like to thank Göran Hermerén for addressing the fact that, where a consequentialist approach was (also) called for, the EGE often discussed proportionality; on the latter, see Hermerén (2012). EGE opinion No 25, p. 42; emphases added. See supra at note 141. EC ‘On the precautionary principle’, COM(2000) 1 final 2.2.2000, p. 2. EGE opinion No 25, p. 42. It is worth mentioning that from the perspective of Art 37 CFR (‘environmental protection’), we shall apply a broad understanding, as according to Rudolf (2014, 558–559, 562), the notion of ‘environment’ comprises air, soil, water, flora and fauna, humans and the environment created and shaped by humans and animals (but no pets). EGE opinion No 23, p. 32. EGE opinion No 23, p. 33; emphases added. EGE opinion No 23, p. 45. Chara (2002, p. 915); emphases added. EGE opinion No 26, p. 45; similar in EGE opinion No 28, p. 73. Ibid. This opinion was delivered four years before the adoption of Regulation GDP. The EGE refers to the first edition in 1958; see nowadays: Arendt et al. (2018). EGE opinion No 29, p. 41. In this context, the EGE also refers to Michel Foucault (1926–1984); p. 40. EGE opinion No 26, p. 42; Aristotle was also mentioned in EGE opinion No 25, p. 11, and EGE opinion No 28, p. 64. EGE opinion No 28, p. 59. 2000–2005; here, the EGE became part of BEPA. Source: Pirs (2017, A37); mentioning twelve other documents in descending order. Cf. Plomer (2008, p. 840). See supra Sect. 1.2 (objectives). Given the information available, it remains unfortunately a challenge to address the question “why and when” a certain approach has been applied. However, this was possible in case of freedom and responsibility. The ‘Explanations relating to the Charter of Fundamental Rights’, OJ 2007 C 303/17, state as follows: “The dignity of the human person is not only a fundamental right in itself but constitutes the real basis of fundamental rights.”. EGE opinion No 12, p. 8. EGE opinion No 12, p. 10. Supra Sect. 3.2.1 (at note 74). Supra Sect. 3.2.1 (at note 56). One exception to this statement is the “competence of Member States as regards ethical issues”, we have seen in the context of GMOs; supra Sect. 3.3.3.3. Supra Sect. 3.2.1, at note 78 (to the Burundian people), and at note 93 (EFTA States’ obligation to provide moral support in the context of EU enlargement). Supra Sect. 3.2.1, at note 79. Supra Sect. 3.2.1, at note 80. Supra Sect. 3.2.1, at note 81. Supra Sect. 3.2.1, at note 82. Supra Sect. 3.3.3.3, at note 264. Supra Sect. 3.2.1, at note 89. As mentioned above, ethics has not been mentioned in EU primary law. Apart from this, ethics also remains untouched by the CJEU (judicial self-restraint). On communitarianism, see infra Chap. 6. Apart from the Polish GMO case, where, by the way, the Polish line of argumentation was not successful. Panichi, J. (2015, February 3). Former science adviser goes public on British television. EuropeanVoice. Retrieved from http://www.europeanvoice.com/article/former-science-adviser-goes-public-on-british-television/.